JJC L-RCRF Camera Body Cap and Rear Lens Cap are specially designed for Canon RF mount cameras and lenses. When storing the camera without a lens attached, the Body Cap can effectively protect the image sensor and internal camera components from dust, moisture, and other elements. Besides that, the Rear Lens Cap also can effectively protect your valuable lenses against scratches, moisture, dust and fingerprints when it is not attached to the camera. JJC L-RCRF Body Cap replaces Canon R-F-5 Body Cap. 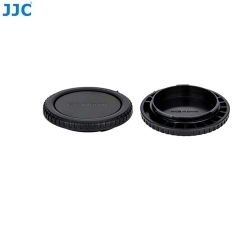 JJC L-RCRF Rear Lens Cap replaces Canon RF Rear Lens Cap.